So Valentines Day is just around the corner and as you know my book “The Guys The Roses & The Regrets; The Girl to Girl Dating Guide” is all about dating and relationships so Valentines Day is a big day of the year for me. I go to conferences, I do interviews and in general I get the word out about me and my book. The other day I was doing an interview and as always I was talking about how important it is to know who you are before you enter into any romantic relationship. It’s important to know who you are because when you go into a relationship you are going to be changed. That relationship will affect you whether that be a good or bad thing. So as I was talking something slipped out I said that if you go into a relationship before you know who you are its kinda like being Playdough. Because you’re mushy, easy to change and easy to mess up. You go into the relationship as Playdough and the guy messes with you, changes you, then the relationship doesn’t work out and you’re left as some weird sculpture (like the one in the photo). All because you were mushy Playdough in the first place! Does that make sense? I thought it was a kinda cool comparison for relationships. The point of the whole Playdough thing is that you shouldn’t be Playdough. You should already be a sculpture before you enter any relationship. You should know who you are, what you stand for, what you want to be, what you want from the relationship and what your boundaries are. Knowing these things makes you a firm sculpture before you enter the relationship and of course you are going to alter a little but the guy won’t be able to make you into whatever kind of sculpture he wants because you’re already a strong sculpture. Well thats it for now so until next time, be blessed, stay strong and remember Don’t Be The Playdough! 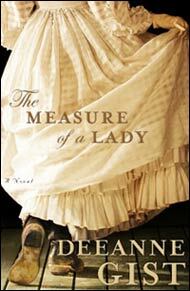 Now the book I wanted to review today is ‘The Measure of a Lady’ by DeeAnne Gist. DeeAnne Gist is one of my favourite christian romantic fiction authors and heres the back copy from her book ‘The Measure of a Lady’ just so you know what the book is about and then I’ll give you my take on it. “Five Rules for Proper 19th Century Ladies. Speak Politely. Even when you’re the only respectable woman around, protesting San Fransicos decadent surrender to gold fever. Dress modestly. Wear your sunbonnet at all times. Ensure nobody sees your men’s boots muddled by the city streets. Remain devoted to family. Protect your siblings from the temptations that surround them, even against their wishes. Stand above reproach. Most difficult when a captivating man turns out to be a saloon owner. Rise above temptation. No accepting gifts. No bestowing favors. No impeachable behavior…well maybe just one…little kiss. So basically its a love story between Rachel Van Buren who recently moved from New Jersey to San Fransisco and Johnnie Parker a former missionary turned saloon owner. While it has all the usual ingredients to a beautiful romance novel, attraction, passion, making each other better people and lots of conflict the reason I adore The measure of a Lady is because it has excellent side stories. As a writer its sometimes very easy to get caught up with the two main characters and forget all about the other people. However the side stories are so important because in real life your family and friends influence your relationships a great deal. In the Measure of a Lady DeeAnna tells a compelling side story about Rachel’s family (brother and sister) as she grows the main story a.k.a the relationship between Rachel and Johnnie. The book is full of passion and love but it also has a interesting moral debate tied into the storyline that makes this books so much more than a romantic fiction novel. As far as what I didn’t like about the book the only thing I can think of is I don’t like Lissa, Rachel’s little sister however the fact that I really dislike the character proves what a good writer DeeAnna Gist is. It just has hard to write a character people hate as it is a character they love. So I strongly recommend this book for anyone who is a fan of romantic fiction just now it is a faith-based book so it does talk about an active relationship with Jesus Christ. If you’re not comfortable with that this may not be the book for you but its a fantastic story full of passion, intrigue and love. So thats my Final Friday review let me know what you thought, loved it, hated it etc and if you have a book you would like me to review next month please comment on this post to let me know you’re suggestions.